The health benefits of kefir as a food are anything but trivial. Food and nutrition, as well as medical, research abounds with scientific studies that have shown the effectiveness of kefir for various health and medical conditions. While Eastern medical traditions have long promoted the "food as medicine" premise, Western societies are only now starting to embrace this philosophy. Westerners, with easy, affordable access to taste-pleasing foods that are high in fat, sugar and refined carbohydrates, have been on an "eat now, pay later" merry-go-round that encourages unhealthy diets, followed by disease and expensive drug- or sugery-based medical treatment. Thankfully, though, this trend is slowly, but surely changing, and kefir deserves nothing less than superstar status in this emerging emphasis on culturing health through diet. First, we'll examine the benefits of kefir due to its standing as a probiotic. Probiotics are foods that contain beneficial microorganisms, primarily bacteria, that promote the health of the host animal. The most popular probiotic currently, due to massive marketing campaigns, as well as taste appeal, is probably yogurt. However, other cultured products like buttermilk and cheeses also count as probiotics. What's the significance of probiotics to health? Well, it all begins in the digestive system. The digestive system plays a vital role in the health of every cell in the body. Nourishment and hydration, as well as toxins and disease-causing agents, can all enter our bodies through ingestion. A healthy digestive system can efficiently extract and distribute nutrients from food, eliminate toxins and also prevent pathogens from multiplying and causing systemic illness. An important part in this system is a plentiful supply of "good" bacteria in the intestinal tract. According to an article in Yoga Journal, the gut is the seat of the body's immune system. An extensive colonization of beneficial bacteria here is credited with a multitude of benefits, including protection from infection, and prevention of gastrointestinal problems, such as constipation and bowel inflammation, as well as other conditions like asthma and allergies. A low count of good bacteria, on the other hand, can open the door to a variety of health issues, including overactive immune system responses and a variety of digestive problems. A deficiency in good bacteria can occur for several reasons. Diet plays a factor, in that "bad" bacteria feed readily on refined carbohydrates, in which the typical Western diet is high, while "good" bacteria need soluble fiber to thrive. Antibiotics, of course, are commonly known to kill the good intestinal bacteria, along with the disease-causing bacteria. However, low levels of antibiotics in meat and drinking water can be enough to damage the colonization efforts of good bacteria and keep them from thriving. Without good bacteria to act as a defense, bad bacteria increase and begin to take their toll on health. The addition of probiotics, either in supplement form, or in food products, can help restore the proper balance of good bacteria. The article, Probiotics Could Help Stress-Induced Gut Problems, reports a study that indicates probiotics are effective in managing intestinal dysfunction that is induced by stress. The study reported that probiotics reduced the adherence of harmful bacteria to the gut wall, and also reduced migration of bacteria into the lymph system. Of all available sources of probiotics, kefir may be one of the most useful. Kefir is cultured at room temperature, rather than with heat, like yogurt. This lower temperature allows more kinds of bacteria to survive, as heat is detrimental to microorganisms (that is why our bodies use fever to combat infections). Kefir contains over a dozen different kinds of microbes--a greater variety than any other probiotic food. These include yeasts, lactobacilli, lactococci, and even vinegar bacteria. Each of the microbes contributes differently to the health of the host. Kefir as a probiotic has been used effectively to treat and prevent urogenital infections in pregnant women, and Lactobacillus in kefir has been shown to actually kill disease-causing bacteria in the large intestine. Furthermore, kefir has been shown to contain microorganisms that can colonize the intestines, providing ongoing benefits, unlike those of other probiotics, which only provide a one-time benefit, and must be replenished. It seems, however, that the benefits of kefir extend beyond just the function of colonizing good bacteria to keep the bad bacteria in check. In contrast to yogurt, kefir does not contain merely a handful of bacteria that ferment the milk or other culturing liquid. Kefir grains are complex colonies of many strains of bacteria and yeast. Kefir: A Symbiotic Yeasts-Bacteria Community with Alleged Healthy Capabilities reports that up to 23 species of yeast can be found in kefir. The symbiotic relationship of the yeast and bacteria plays a very important role in generating the unique properties that result in the benefits of kefir. The community of kefir organisms produces lactic acid, antibiotics and bactericide during the course of fermentation of the milk or other liquid. The microorganisms in kefir grains are held together by a gelatinous substance known as kefiran. Kefiran is produced during the metabolism of milk lactose by a strain of the bacteria present. The presence of the yeast in kefir grains has been shown to increase both the rate of kefiran production and cell growth. These results suggest that milk and soy milk kefirs may be considered among the more-promising food components in terms of cancer prevention and enhancement of mucosal resistance to gastrointestinal infections. On a less serious note, lactose intolerance is a condition that affects a large percentage of the adult population. Kefir has been shown to improve lactose digestion and tolerance in affected people. Another study conducted on mice showed that milk and soymilk kefir supplementation reduced blood levels of components known as IgE and IgG1, which are associated with allergic responses. This indicates that another of the benefits of kefir is in the role of preventing or minimizing food allergies. Ever heard that announcement on an infomercial? Everything sounds good, up to that point, but not good enough to make you leave that couch and grab your phone and credit card. But, then, the announcer uses that famous catch phrase and doubles or triples the products you will get for the same price. Suddenly, it's worth the effort to get off that couch and make the call! 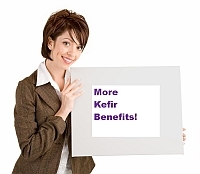 So, if you're not sold yet, here are a few more benefits of kefir that might convince you. Kefir has shown substantial antimutagenic and antioxidant properties. Kefir is believed to suppress UV damage in cells. Kefir demonstrated beneficial effects on cells that have been damaged by radiation. Kefir "significantly decreased" serum total cholesterol and phospholipid levels in a study on rats. Kefir has been shown to stimulate the immune system. Kefir is nutrient-rich, containing protein, vitamins and minerals. Kefir generally receives the credit for the renowned length of life spans of the people in its originating region of the Caucasus. There's no question that kefir is an enormously beneficial food. It's not speculation or subjective opinion--scientific studies have shown the direct correlation between kefir and a multitude of health benefits. And, if you take the nutrition of goat milk and add in the benefits of kefir...you can't go wrong! Still not convinced? Why not try a 30-day kefir challenge? Pick up a carton in your local dairy case, or order some starter culture or kefir grains and learn how to make kefir for the best benefits. Drink a glass daily for a month, and then decide if kefir is worth adding to your diet permanently. Of course, you may like the taste so much, you'll forget you were drinking it for the health benefits! Boerner, Heather, "Go with Your Gut," Yoga Journal, pp.49-52, September 2008. Cronish, Nettie, "Tangy Tasting Kefir," Alive: Canadian Journal of Health and Nutrition, pp. 114-115, November 2007. Daniells, Stephen, Probiotics Could Help Stress-Induced Gut Problems, NUTRAingredients-usa.com, April 25, 2006. Davis, Jeanie Lerche, Kefir Helps Lactose Intolerance, WebMD, May 30, 2003. Hertzler, Steven R. and Shannon M. Clancy, "Kefir Improves Lactose Digestion and Tolerance in Adults with Lactose Maldigestion," Journal American Dietetic Association, 103(5):582-587, 2003. Lewis, Genevieve, "Probiotics: A Better Way to Treat Infections During Pregnancy," Midwifery Today, pp. 30-31, Autumn 2006. Liu, Je-Ruei, Sheng-Yao Wang, Yuh-Yih Lin, and Chin-Wen Lin, "Antitumor Activity of Milk Kefir and Soy Milk Kefir in Tumor-Bearing Mice," Nutrition and Cancer, 44(2), 182-187, 2002. Lopitz-Otsoa, Fernando, Aitor Rementeria, Nataliz Elguezabal and Javier Garaizar, "Kefir: A Symbiotic Yeasts-Bacteria Community with Alleged Healthy Capabilities," Revista Iberoamericana de Micologia, 23:67-74, 2006. Articles are updated frequently, so check back here for any new information on the health benefits of kefir!